Best grown in organically-enriched soils in light shade to full shade, but tolerates full sun as long as soils are kept consistently moist. If grown in pots, this plant needs a deep pot in order to accommodate its deep taproot. Will self-seed in the garden. Myrrhis odorata, commonly known as sweet cicely, sweet chervil or myrrh, is an herbaceous perennial that is native to grassy banks and woodland areas of central Europe. It has widely naturalized in Europe over time. It typically grows in a bushy clump to 2-4’ tall and as wide with upright, hollow, grooved, branching stems clad with 2-3 pinnate, deeply cut, finely-divided, fern-like leaves (each to 12” long) having a pronounced aroma and flavor of licorice and aniseed. This plant is typically grown in gardens as a culinary herb or flowering perennial. It was once popularly grown in herb gardens not only for enjoyment of the fragrance and aniseed-taste of its ferny foliage but also for certain medicinal purposes (treatment of stomach complaints and improvement of digestion). It is not commonly found in herb gardens today. Leaves are dark green in summer, turning gold in fall. Tiny white flowers compacted into 2” diameter compound umbels bloom in early spring. Flowers give way to ribbed fruits (to 1” long) which provide ornamental interest in summer and fall. Dark brown, licorice-flavored seeds mature in fall. Genus name comes from the Greek myrrhis meaning smelling of myrrh. Specific epithet comes from the Latin odorus meaning fragrant. This plant is the sole species in the genus Myrrhis. 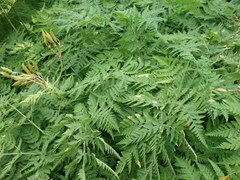 Greeks called this plant seselis or seseli in reference to its sweet flavor, hence the probable adoption of the common name of cicely. In reference to common names, cicely is perhaps best used for Myrrhus and myrrh is best used for Commiphora. Borders and beds. Herb gardens. Woodland areas. Likes shady areas. As a culinary herb, it is a valuable sweetener especially for diabetics. All parts of the plant are edible (leaves, roots, flowers and seed). Leaves can be cooked like spinach, chopped and added to soups. Crisp stalks make a good substitute for celery after light cooking. Roots can be eaten raw, in salads, or boiled and eaten like parsnips. Flower buds are edible but can also be used for decorative purposes. Young tender seed pods can be eaten as a snack food. Seeds may be used as a flavoring, e.g. added to ice cream and pies. Seeds were once used to polish and perfume wooden furniture.